Check out the World Book Day site for more details on this fantastic initiative. I think this is a great idea. One of the best presents you can ever give a child in my opinion is an introduction to reading which will hopefully lead to a life long love of books and of reading. It is the present that will keep on giving for the rest of their life and will inspire them, encourage them, entertain them and teach them of worlds beyond their own. I think a few of my favourite quotes will say it much better than I can. When we decided we wanted to adopt a child, we wanted to buy something to mark our decision as we knew it would be a long time before it would happen (we were right!). And for both of us, we knew immediately it would be a book. 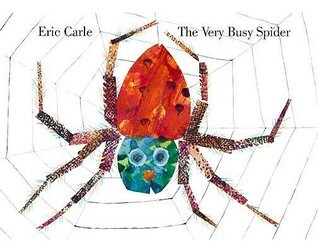 This one to be precise – The Very Busy Spider. I know, not exactly cute and cuddly but due to some very strange co-incidences this was the book we choose and it will always be special to us. Happy World Book Day everyone, happy reading and if you have a little one in your life, be sure and read them a special story to celebrate. Bookish Chat : Any other picture book recommendations for me? We have a good few but are always on the lookout for more.